This is a notice of an opportunity to provide pro bono representation in a trial and all matters leading up to trial. The case is Demetrius Laredo Walker v. Herron, et al., Case No. 1:17-cv-079-MW-GRJ. The trial will take place in the Gainesville courthouse. This is a notice of an opportunity to provide pro bono representation in a trial and all matters leading up to trial. The case is Kidane B. Mengesha v. Stokes, et al., Case No. 3:16-cv-446-MCR-GRJ. The parties have tentatively consented to the magistrate judge’s jurisdiction and agreed that the trial will be held in Tallahassee. 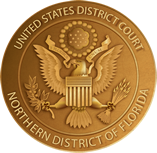 The United States District Court for the Northern District of Florida is seeking qualified applicants for the full-time position of Official Court Reporter in the Tallahassee Division. An Official Court Reporter is responsible for the verbatim reporting of proceedings held before United States District Judges and Magistrate Judges and for the transcription of those proceedings upon request. Click here for more information. This is a notice of an opportunity to provide pro bono representation in a jury trial. The case is Quincy Alexander Williams v. Rickman, et al., Case No. 5:13cv9-MW-GRJ. Although this is a Panama City case, the trial will take place in the Tallahassee courthouse. The current four-year term of Kevin L. Butler, Federal Public Defender for the Northern District of Alabama at Birmingham, expires 16 October 2019. The Federal Public Defender, under authority of 18 U.S.C. § 3006A(g)(2)(A), provides criminal defense services to individuals unable to afford counsel and supervises a full-time staff of attorneys and administrative and clerical personnel. Plaintiff, an inmate in the Florida Department of Corrections, currently incarcerated at Tomoka Correctional Institution, seeks relief under 42 U.S.C. § 1983 in connection with alleged deliberate indifference to Plaintiff’s serious medical needs. A Clerk’s default has been entered with respect to two defendants, and the Court is prepared to set an evidentiary hearing with respect to Plaintiff’s damages claim. Jury scams have seen a resurgence in recent months. If you receive a phone call or an email from someone claiming to be a court official, DO NOT give them your social security number, credit card number, or other personal information. If you receive such a call or email, immediately contact the jury administrator by phone, toll-free, at (866) 560-4756 or by email using our online contact form.